This letter sure has dominant genes — a 1953 missive from the co-discoverer of DNA’s structure to his 12-year-old son explaining how “life comes from life’’ was auctioned for a record-setting $6 million on April 10th. 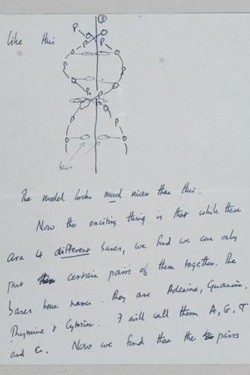 Francis Crick’s so-called “secret of life’’ letter to his son Michael at boarding school, saying that he and James Watson had discovered DNA’s double-helix structure, went for $5.3 million at Christie’s in Rockefeller Center. The total hit $6,059,750 with the buyer’s commission. The handwritten, seven-page note, which the auction house had estimated would fetch “only” $1 million to $2 million, set a world-auction record for any letter, it said. The previous record was $3.4 million, set in 2008 by an Abraham Lincoln letter, said Francis Wahlgren, Christie’s international department head of books and manuscripts. The winning bid was made over the phone by a “private individual’’ who wants to remain anonymous for now, he said. Crick, Watson and Maurice Wilkins were awarded the Nobel Prize in 1962. The letter to his son was written about a month before the landmark research was published. In easy-to-understand language, it says “We have built a model for the structure of de-oxy-ribose-nucleic-acid (read it carefully) called D.N.A. Our structure is very beautiful,’’ he tells his boy. After leaving England, Francis Crick, who died in 2004, spent decades doing research at the Salk Institute in California. His family has said half the proceeds of the letter’s sale will go to benefit the institute. Scientists have found an enormous, previously unknown, species of venomous spider in a remote Sri Lankan village. The giant tarantula is as big as a human face. Its legs, which have unique daffodil-yellow markings, span a massive 20cm (eight inches). The arachnid also has a distinctive pink band around its body. The new species was found in the war-torn north of the South Asian country by scientists from Sri Lanka’s Biodiversity Education and Research (BER) organization. It has been named Poecilotheria rajaei, in recognition of senior police officer, Michael Rajakumar Purajah, who guided the research team through a hazardous jungle overrun by civil unrest in order to seek out the spider. The arachnid had originally been presented to BER three years ago by villagers in Mankulam, who had killed a male specimen. Scientists immediately realized the dead spider was not like anything they already knew and a group was charged with finding any living relatives. The living Poecilotheria rajaei were eventually discovered in the former doctor’s quarters of the village’s hospital. According to wired.com, Ranil Nanayakkara, the co-founder of BER, said: “They are quite rare. 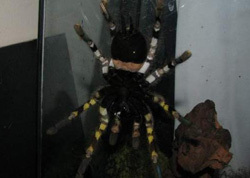 The website described the tarantula as “colourful, fast and venomous”. The species is said to be related to a class of South American tarantula that includes the Goliath bird-eater, one of the world’s largest spiders. In other reports Mr Nanayakkara is quoted as saying none of the tarantulas found in Sri Lanka have bites that are deadly to humans. 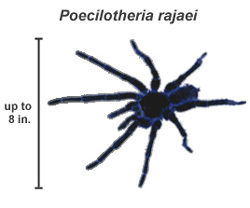 However, the Poecilotheria rajaei would be able to kill animals as large as mice, lizards and small birds and snakes. Sotheby’s will auction the Bay Psalm Book in November. Now, Boston’s Old South Church is planning to sell a rare copy of the psalms—the first book printed in America—for $15 million to $30 million at Sotheby’s in New York this fall. If the church gets its asking price, the Bay Psalm Book will be the most expensive book ever sold at auction, surpassing an $11.5 million copy of James Audubon’s “Birds of America” that Sotheby’s sold three years ago. In 1947, the last time another version of the psalm book came up for auction, it sold for $151,000—a record price at the time that topped sales of Shakespeare’s First Folio and the Gutenberg Bible. Only 11 copies of the psalm book survive today; Yale, Brown and Harvard universities own other versions, as does the Library of Congress. Because there were no printing presses in the wilderness, the group sought help from a London-based Calvinist minister, Josse Glover, who raised money to buy a press, letter types, paper and ink. Rev. Glover hired a locksmith, Stephen Daye, to help operate the press, and together with their families they set sail on the ship John of London in 1638. Glover died en route, though, so it fell to Daye and his 18-year-old son Matthew to finish the job once they arrived in the town of Cambridge. Mr. Redden said their lack of experience may explain why some of the book’s psalms are out of order, with passages cut off early and picked up pages later. From The New York Post, Sky News and The Wall Street Journal.